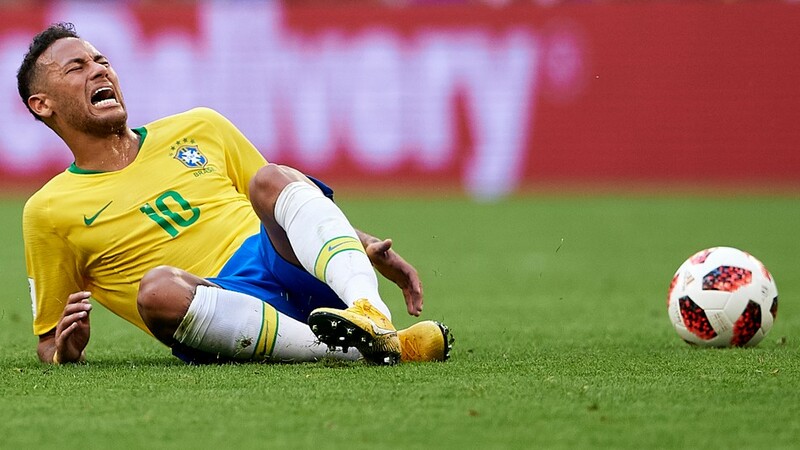 Neymar's father says the Brazil and Paris Saint-Germain star's frequent tumbles to the ground cannot be characterised as diving but are instead a "tactic" to keep oft-fouled forward from harm. Neymar earned a negative reputation for his on-the-floor antics at last summer's World Cup in Russia, with videos and memes of his exaggerated falls going viral as the former Barcelona and Santos man became a source of ridicule during the tournament. However, Neymar Sr. has told SporTV his son has used the trick of jumping into the air before receiving contact as a way to escape fouls since he was a youth player. "They call it diving and simulation. He doesn't dive, it's a tactic that he's used since the academy, since he became a professional," Neymar Sr. said. "I told him, every dispute for the ball you enter into, you will lose, but if you arrive before, yes. If you see you will receive a hit, jump into the air. You can take a barbecue skewer, throw it high, then take a sledgehammer and hit it in the middle, and it won't break. But keep it on the ground and any touch will break it. "I had to give this warning to my son that he was not going to win [physical challenges], so he needed to be smart on the pitch until he was mature enough to fight. And this talk of him diving is wrong. He added: "I'm not criticising those who say he is diving or not, I am saying that the referee has to have an understanding not to restrain certain things, to know if it is or isn't simulation." has told SporTV his son has used the trick of jumping into the air before receiving contact as a way to escape fouls since he was a youth player.